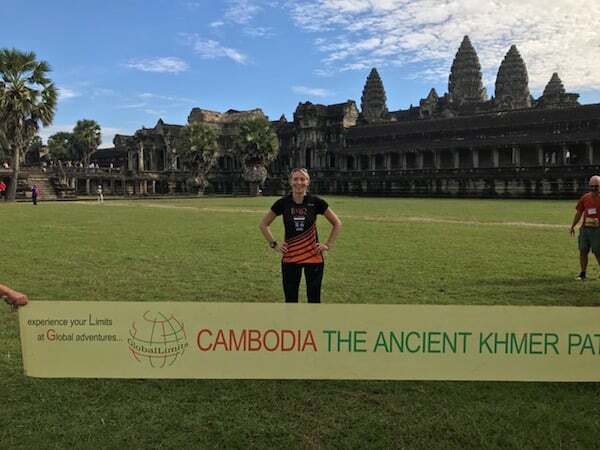 After 6 incredible and adventurous days of racing, Sally Ford finished third overall and took the win for the Ladies at the Global Adventures Cambodian Race. “The 220Km challenging race was divided into 6 stages, which took in many impressive sights and some ancient culture. The race started from a Buddhist temple and then followed the ancient route of the Khmer Path. It ran through unspoiled tiny villages and past some ancient temples, one of which served as a filming location for the movie “Indiana Jones.” The route then continued on to embrace a 25m high waterfall, which was very welcoming, as at times the temperatures for the race exceeded 30 degrees. We then finished at the World heritage site of Angkor Wat. All in all an incredible experience.